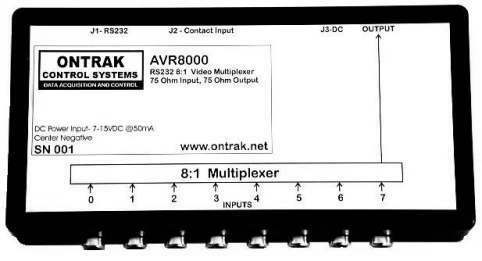 The AVR8000 RS232 based, 8:1 Video Multiplexer / Video Switch allows switching of up to eight video sources to one monitor, VCR, or video capture card. The video multiplexer was designed for use in Point-Of-Sale systems and is suitable for security and industrial monitoring applications. The solid-state switching circuits feature buffered inputs and output, ultra-low switching transient (10mV p-p), and ESD protection on all connections. Contact inputs for motion detectors or external manual switch allow manual video switch control (no host computer) or switching based on motion detection. Timed switching mode allows scanning of inputs with user set dwell time. Mode 1 allows the use of an external switch ( not provided ) to select which input is routed to the output. Motion detector outputs of cameras can also be used for switching.There are eight contact inputs on the AVR8000 video multiplexer which allow the use of cameras equipped with motion detectors to be used to determine which channel is routed to the output. A host computer is not required but may be used to monitor motion and/or video signals. Video output can then be routed to a VCR, video monitor or video capture card. Mode 2 allows full control of switching via an RS232 connection. Simple ASCII commands allow channel selection, and also, monitoring of the eight contact inputs. Software interrupts may be enabled to notify host of contact input ( motion ) status changes. Video output can then be routed to a VCR, video monitor or video capture card. Mode 3 enables switching of channels based on time intervals set by the host computer. Dwell time is set from 1 to 255 seconds. Video output can then be routed to a VCR, video monitor or video capture card. Integrated ESD protection on all inputs and outputs. 8 Contact inputs for motion detection or external channel select switch. Manual, Motion, Host (RS232), or Timed Control Modes. 94V-0 Enclosure with rubber mounting feet.